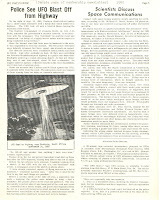 Once the two largest (in terms of membership) civilian UFO investigative organizations in the world, the National Investigations Committee on Aerial Phenomena (NICAP) and the Aerial Phenomena Research Organization (APRO) exerted what influence they could afford with absurdly tight budgets to attract members. In 1965, NICAP borrowed an interesting page from a 1965 issue of its own journal, The UFO Investigator (which first appeared in 1956), and widely distributed it (see blurb at top of page) to both press and public in order to boost membership. I'm taking the liberty of reproducing it here, and also wish to reiterate that the Center for UFO Studies (CUFOS -- see link in margin) offers for sale a complete set of The UFO Investigator, in addition to other NICAP items, on a reasonably priced compact disc. CUFOS received NICAP's files after the organization closed. The other four pages here involve a special four-page brochure issued by APRO in 1974, probably the best- looking device the organization had ever printed to interest potential members since its inception in 1952. While some of the information is dated and elaborated on elsewhere by now, the basic writing and integrity of the publication truly does reflect APRO as it once existed, long before the tragic end of both the organization and its founders, Jim and Coral Lorenzen, explored in some depth via this blog over past months. Previously, we've explored cases where UFOs apparently have the ability to interfere with -- and completely shut down -- our missile defense systems. Indeed, a former Air Force officer who was on duty when his base experienced this very event and subsequently wrote a book about it sent me a note (see entry for August 31, 2007) confirming that UFOs possess this incredible ability. However, long before military officials encountered these highly troubling incidents the world's governments knew all too well that the enigmatic UFOs often affected aircraft instrumentation, and many a pilot and crew reported instant and total system failure during UFO incidents. Generally, once the strange objects either departed or aircraft chases were aborted, all systems returned to normal. The official three-page document shown here is a photocopy from my old files and, obviously, was declassified. I don't recall who passed it along to me, but I do believe it's legit and probably available on other UFO-related sites as well. For those unfamiliar with this particular incident, this important case occurred over Iran (when, needless to say, a somewhat reasonable degree of sanity watched over government operations) in September of 1976. Read carefully through this amazing account, for these are evidently the same words officials in Washington, D.C. initially read over 30 years ago, faced not only with the startling admission that UFOs affected military aircraft instrumentation, but also with the incredible revelation that aircraft weapons systems seemed also to have been incapacitated by UFO activity. Isn't it incredible, knowing that such fantastic incidents occur with some international regularity, how the giants of U.S. media and government simply let this stuff pass by, time after time, as if barely worthy of mention? No, it isn't incredible at all. We, the people, are not being served as the Constitution intended, and as long as we blissfully prefer to bask in lies, arcane political diversions, relentless TV and radio commercials and programs sired in hell, and fantasies of faith concocted by ancient storytellers who had nothing better to do than invent fictional garden tales intended to keep everybody securely frightened and disciplined under their dominant thumbs, we will continue to be the obedient sheep of politicians' dreams. And still, those damned weird things in the sky zip in and out of our unsettled lives, as if with purpose. Remember the crater? On September 27, 2007 (the search engine above will assist in locating this and other older blog entries) we briefly described a mysterious explosive sound heard late at night (at about 12:30 a.m.) near the town of Venice, NY on November 12 of 1966. 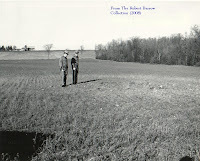 More precisely, the noise was heard near or over the farm of Howard Lacey, and when people investigated the next day they discovered a small crater in his field. I had been searching for the photos displayed here and just located them, so here they are to add a little substance to my initial report. All four photographs were accomplished by the New York State Police in November, 1966, and they kindly provided copies to me early in 1967, as I had not visited the site. 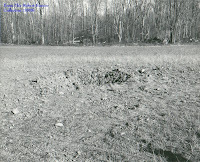 Nevertheless, the crater did enjoy visits by some pretty impressive visitors, including various military personnel (the Air Force unit at Syracuse's Hancock Field also dispatched an officer or two), and scientists from Syracuse University performed extensive soil analysis and other studies of the enigmatic hole (I reviewed their lengthy and detailed reports at that time). 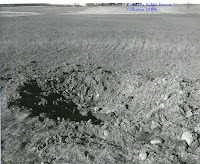 At first, it was widely believed that this would turn out to be an impact crater from a meteorite, but investigations actually disclosed no supporting evidence. Explosive devices were ruled out almost immediately. Ultimately, no cause was determined. But mystery and intrigue were hardly about to depart Lacey's farm. 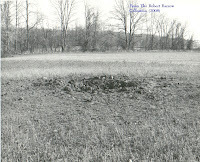 On exactly the same date and time for the next two years, explosions again rang out near the farm and the apparently obligatory fresh crater would be found the next day. However, when crowds showed up in an almost festive atmosphere of eager anticipation the fourth time, in November of 1969, they left in disappointment when nothing happened. To my knowledge, no further explosions or craters materialized in the years following and no obvious evidence of a hoax was evident. Just one of those things. . . 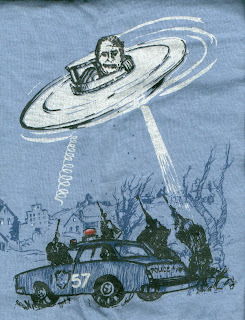 When we recently reviewed a very important period of UFO sightings throughout Central New York during 1978, I mentioned a T-shirt peddled successfully on the streets of Syracuse, resulting from a bitter conflict pitting Syracuse Police Department personnel and their chief, the late Thomas Sardino, against one another. 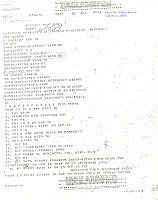 Though a combination of factors caused this dispute to boil over and surface publicly, the basic story here involves a very unwelcome code of silence that Sardino attempted to impose upon his officers. A number of them, like members of the general Central New York population, reported their own intriguing UFO sightings publicly, causing local and national media to exert pressure on local official agencies for more information. For several weeks, the UFO issue appeared to supercede customary cops-and-robbers duties in Syracuse (and, actually, amongst numerous law enforcement agencies in the region). At some point, annoyed with his officers revealing their sightings -- and their personal feelings about him -- to the press, Sardino attempted to impose a news blackout and insisted that his officers shut up about UFOs. Things became increasingly ugly, particularly between the chief and a specific officer or two or three, and it wasn't long before this (click on and enlarge the visual) T-shirt hit the streets of Syracuse, with the help of Sardino's subordinates. I regret that the artist's name is unknown to me, otherwise I should like to offer credit. The artwork here isn't clear enough for detail, but that's chief Sardino depicted in the flying saucer with a routine cigar protruding from his mouth, and he appears to be shooting a death ray or something at his officers as they fire back at him with an arsenal of firearms. The number 57 on the Syracuse police car does have a meaning, but I can't recall specifically -- I think it references a certain "trouble-making" police officer's patrol vehicle. I only just found the shirt in my collection-o'-things (no small feat, I assure you). So now you know a little more about Syracuse than you probably wanted (Obligatory weather note: I'll soon believe that winter's bitterness visits this area for nine months out of 12, or, no, make that 10 months out of 12, and any consecutive days ripe with sunlight during the rest of the year resemble a near-miracle), but despite a lot of deadly serious UFO reporting in Central NY at that time the T-shirt was great humor relief -- and, need I mention, its appearance further outraged chief Sardino, and I can only imagine the words and vulgarities exploding throughout his department as fellow officers tried not to laugh in his presence. I don't recall that he was very much for a public sense of humor, though, in all fairness, he and his people did run a good department when non-UFO matters were involved. However, let this be a lesson for chiefs of police everywhere: Gentlemen and ladies of the law, if your officers see saucers, for gosh sakes, let 'em talk publicly, and be very, very kind, please. They're probably seeing something, not nothing, and UFO research is piled high with excellent UFO observations reported in depth by police officers all over the world. And you sure don't want to end up on a T-shirt because (obviously) that thing will be around, chief, to haunt your reputation forever. Vote for the 1956 Movie, "U.F.O." Thank you, and thank you Barry for your extensive knowledge about UFO history and the movie. When we spotlighted Maj. Donald E. Keyhoe's early years as a writer recently, I hoped to demonstrate that people concerned about UFOs usually have other lives as well, activities more in tune with society's routine expectations. The late Frank Edwards, once a powerful voice behind the microphones of the Mutual Broadcasting System and an early TV celebrity, was a friend of Keyhoe, and an influential NICAP board member who authored several books. He may be remembered particularly for his blockbuster book, Flying Saucers: Serious Business (excerpts of which he narrated for an LP record album of the same title on the RCA Victor label in the sixties) and the follow-up, Flying Saucers Here and Now. For years, he kept American audiences current on important UFO incidents, and reports involving military and airline pilots kept 'em on the edge of their chairs. As successful as he found his dramatic UFO-related broadcasts for an enthusiastic nationwide audience, however, Edwards actually started out as a young man experiencing radio's early years of adventure, unencumbered by arduous and intrusive regulations endorsed by such official agencies as the Federal Communications Commission. Edwards' 1956 paperback autobiography, My First 10,000,000 Sponsors, allowed readers a personal look into a unique broadcast career touched by both tough and rewarding times. Did he embellish and over-dramatize now and then during broadcasts? The answer to that question might be found in one word, an intimidating albatross chained around the neck of every broadcaster ever born: Ratings.